When we apply for a loan, or a promise to be responsible for the use of a car, or anything of legal importance we sign our name at the end of the document. By applying our name, our reputation so to speak, at the end we are showing our acceptance to the terms. The “Amen” that we use so often in religious prayers and actions dates back to the Old Testament. Its meaning is Yes, I believe, So be it, I accept. It is our verbal signature of what just happened, of what was just said. 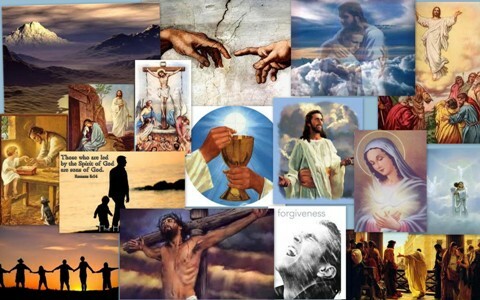 We have just enumerated in the Creed all the articles of faith that a Catholic Christian believes. And just like all of the other prayers and significant actions, it too ends with an “amen”. This is not like a period at the end of a sentence. This is our TOTAL acceptance of what just happened. It is not to be taken lightly. It is our bond, our belief, it is who we are. In keeping with this understanding, let’s take a look at the “Great Amen” within the Mass. It, too, means Yes, I believe, So be it, I accept. What then makes it great? In the Mass, the priest holds up, for all to see, the newly consecrated bread and wine, now the Body and Blood of Jesus Christ. Christ is present on our altar. The sacrifice of the cross is once more offered up for our sakes. At this moment, the priest says, “Through Him, with Him and in Him, in the unity of the Holy Spirit, all honor and glory are yours, Almighty Father, forever and ever.” The implication is indisputable. Only through Christ can honor and glory be given to God. Why are we at Mass? Because of an obligation? To see our neighbors? We are there to give honor and glory to God. We are there to join ourselves, our lives to Christ through love. In this unity with Jesus, we sanctify our actions that we do for others, we make holy the sufferings and anxieties that we experience and willingly accept. Our lives and everything that they entail, we humbly associate with Christ. So that together with Christ, we can give our measure of honor and glory to God, as well. AMEN. AMEN. AMEN.